The 11-30 Miami Heat will host the 32-11 Houston Rockets at American Airlines Arena, Miami, Florida Tuesday night. Houston opened as 7.5 point favorite with the total set at 221 points. The game has a 7:30 PM EST tip off and will be televised on NBATV, RTSW & SUN. The Heat have the second worst record in the Eastern Conference, and they head into this game on a four-game slide. Ending that won’t be easy against a Rockets squad that holds the the third best record in the West. 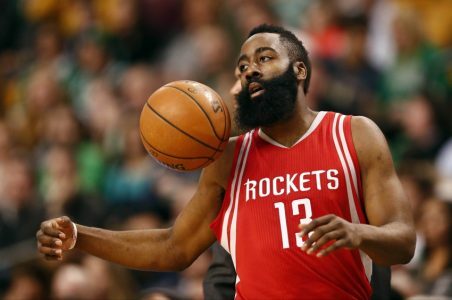 This will be the first meeting of the season, but the home team is 5-1 ATS in the last six meetings in the series and the Rockets have covered the spread in six of the last eight encounters. The Rockets are a much improved team from last season, but they had lost back-to-back games before trashing the Nets 137-102 at Brooklyn on Sunday. Standout superstar James Harden posted his 12th triple-double for the season with 22 points, 11 boards and 11 assists and knocked down four of the team’s 21 3-pointers. Houston leads the NBA with 40.0 3-point attempts per game and the efficiency is excellent at 37.5 percent. Their outstanding shooting from behind the arc is the main reason Houston is averaging a healthy 114.9 points per game, but their play on the defensive end of the court leaves much to be desired giving up 107.6 points per game. Houston has an average point differential of +7.3 for the season which is third best in the NBA behind Golden State and San Antonio, but the Rockets are turning over the ball a fair amount at 14.8 turnovers per game. They average 44.3 offensive boards while allowing opponents to drag down just 42.5 per game, both numbers rank in the top 10 in the league. The Rockets are 10-2 ATS in their last 12 road games vs. a team with a home winning % of less than .400 while the over 6-1 in their last seven road games. Miami has lost four straight and 13 of its last 15 games. The Heat will play just their second home game since the turn of the year as they’ve been on the road since January 3. The six-game journey concluded with a 116-108 loss at Milwaukee on Friday, a game where the Heat allowed Milwaukee to shoot 9-for-15 (60%) from behind the arc, and they were clubbed 46-27 on the glass in the game as well. The Heat have struggled offensively all season long, and they sit 29th in the NBA for scoring average at 98.3 points per game while surrendering 102.8 points per game. Miami has an average point differential of -4.5, but the Heat are taking fairly good care of the ball turning it over just 12.3 time per game on average. They’re dragging down 44.1 boards per game but are allowing opponents 45.3 rebounds per game, which is tied with Orlando for the fourth worst mark in the league. Hassan Whiteside leads the NBA in rebounds averaging 14.3 per game, but he’s not getting much help from his teammates. The Heat are well rested and 5-2 ATS in their last seven games playing on three or more days rest, but only 7-22 ATS in their last 29 home games following a road trip of seven or more days. Under is 7-2 in their last nine home games following a road trip of seven or more days but the over is 20-8-1 in the Heat’s last 29 games playing on three or more days rest. Lay the points on the Rockets. Miami is struggling to defend the perimeter, and that will prove costly here against one of the best 3-point shooting teams in the NBA.